We have now finished our sixth dog training walk with the pups. Last week I took Zeaver on her own and she was a lot less bossy and shouty without her sister. Zolli is going next week on her own. They are basically very well-behaved, if a little reactive to other dogs, ie loud and bossy but scared. This is why we have been attending training walks with other dogs since the pups were 8 months old, they are now a year. They have mastered their sits, they wait patiently with doors open both in the house and the car, and are very good at recall, they do not stray far and walk to heel pretty well both on and off the lead. Having walked through towns a lot lately, they are not worried about meeting children, joggers, bikes and now horses. I knew it would happen eventually, Zolli is not interested at all, but Zeaver loved to chase the horses. They have been out on rides with us and Zolli tucks herself in behind the ponies and stays there.. Zeaver runs around and alongside far too close. When we were in our field and she was loose, she chased them right at their heels. Then one day last week, we had Merlin (luckily with no shoes on) up in the paddock near the house and Zeaver took off (ignoring me completely) after him barking at his heels as he lashed out with both barrels several times until at last there was a squeak and Zeaver came flying out of the field looking for sympathy and looking very sorry for herself. We gave her none and carried on about our business in the garden and she disappeared indoors and hid in the soft crate in the sitting room. She was, thank goodness unhurt, but she has not even looked at a horse since. It was a short sharp lesson, which needed to happen and I am hugely relieved as I had had nightmares of much more terrible results of her horse chasing. The training walks are fantastic, we meet our trainer at a beautiful spot in the middle of nowhere along with a wide variety of other dogs 7 or 8 in total. We all walk off up the hill trying to show off our brilliant heel work..(!) it never goes as well as we want! There are Cocker Spaniels, Weimeraners, Labradors, Lurchers, Setters and all sorts as well as our two. We all then stand on the track with our dogs sitting beside us while one person makes their dog stay while they walk to the end of the line of owners and dogs and then call…. 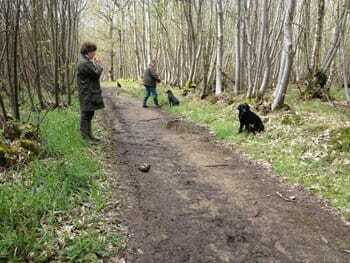 assuming they are still staying.. we each have our turn, then walk on with some on the lead and some off. then we recall, do more training then more loose work. We are loving it. There is one Weimeraner there who hates coming and apparently goes and hides when he knows he coming to school. He always sits with his back to the group trying to pretend we are not there! Our Trainer, a Gun dog Trainer, Behaviourist etc has the patience of a saint with all the different dogs and owners and it is really interesting seeing how much the owners have achieved each week although they are different dogs each time, which is really good for them. Most of the owners have one problem or another with their dogs, whether it be lunging at cars or other dogs on the lead, or barking madly … I feel though that we are making progress. Yesterday out at Iron Hill I managed a 10 pace double stay with the pups which was a good breakthrough, up to now.. one of them would drift off before I had got three paces away!